Does that pond make you think about your grandfather? Can a Moon Pie ignite sweetness past its inherent sugar content? 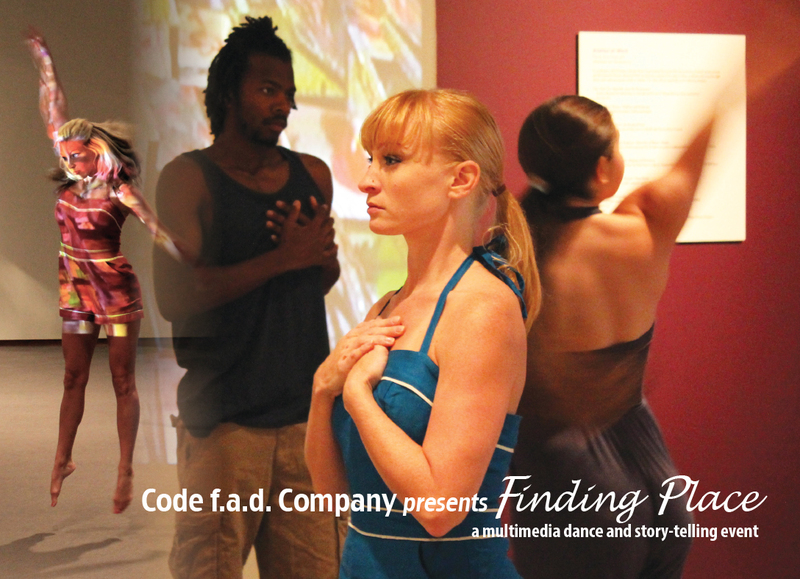 Created by Artistic Director Autumn Mist Belk with music by Proxy (G. Todd Buker) and stories contributed by the dancers, Finding Place is a multimedia dance and story-telling event about community and how objects can trigger memories. Finding Place began in the summer of 2012, with a commission from the North Carolina Museum of Art to make a 10-15 minute dance inspired by the artwork of El Anatsui (on exhibition at the time). Anatsui’s use of found or recycled objects and themes of family and community served as a jumping off point for the work. Since July, Code f.a.d. has expanded the work to its current evening-length version full of dance, film, and poignant memories told by the dancers, but the company has also kept the connection to the static visual arts, incorporating the photography of Belk and new Code f.a.d. collaborator Jason E. Law. How do we find our place in society? Dancers and music begin to fill the space, starting our journey through the moments that helped to shape our dancers’ lives and visions of this society to which we all belong. The work cycles through the upbeat and whimsical recollection of Aunt Judy’s creepy clowns to the heart-wrenching remembrances of parents working tirelessly as police officers in New York during the aftermath of 9/11. Of course, those objects in our trunk are also explained as the audience is engulfed with Belk’s signature combination of fast-paced, often acrobatic athleticism mixed with minimalist gesture and stillness. Finding Place premiered on February 22, 2013 at the Durham Arts Council. Visit our Facebook page for some photos from the show, or watch below for some of our favorite “behind-the-scenes” shots!